New York, Boston and Philadelphia saw their populations explode with immigrants driving up the demand for ice. During this time, nearly every family, grocer and barkeep in America had an ice box. In 1879 one company, Consolidated Ice had 3,000 horse-drawn ice wagons delivering to consumers in New York City. The ice wagon was the supply chain for domestic and small commercial customers. By 1879 households in the eastern cities were consuming almost a ton of ice per year and it required 3000 ice wagons just to supply ice to consumers in New York. 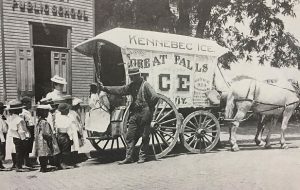 For this use, ice blocks were cut into 25lb, 50lb and 100lb blocks and distributed by the “iceman” driving the horse drawn ice wagon. Using ice tongs, the iceman would deliver the ice to houses and businesses.